From Newbery Medal winner and bestselling author Sharon Creech comes a grand, sweeping yarn that is a celebration of the great and unexpected gifts of love, friendship, and forgiveness. 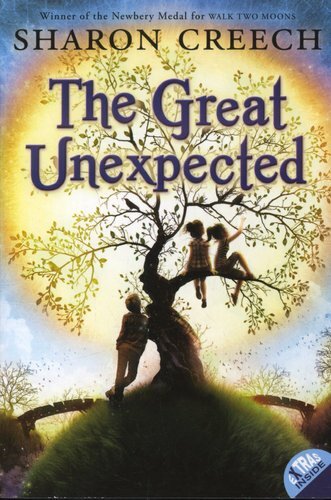 With a starred review from KirkusReviews calling it an "enchanting tale to treasure," The Great Unexpected captures the heart and the imagination. 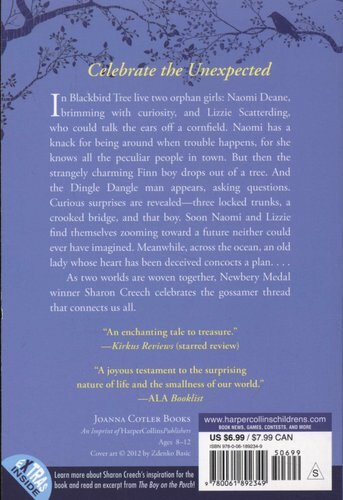 Humorous and heartfelt, this is a story of pairs--of young Naomi and Lizzie, both orphans in present-day Blackbird Tree, USA, and of Sybil and Nula, grown-up sisters from faraway Rook's Orchard, Ireland, who have become estranged. Young Naomi Deane is brimming with curiosity and her best friend, Lizzie Scatterding, could talk the ears off a cornfield. Naomi has a knack for being around when trouble happens. She knows all the peculiar people in town--like Crazy Cora and Witch Wiggins. But then, one day, a boy drops out of a tree. Just like that. A strangely charming Finn boy. And then the Dingle Dangle man appears, asking all kinds of questions. Curious surprises are revealed--three locked trunks, a pair of rooks, a crooked bridge, and that boy--and soon Naomi and Lizzie find their lives changed forever.